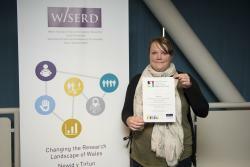 Ceri Dalton, whose research is looking at challenges when evaluating co-produced projects, won the three-minute engagement/impact session competition. This is a variant on the now well-established ‘three minute thesis’ format, but with a focus on how the researcher meets challenges and/or successes with engagement or impact. The prize is in the form of a selection of recent books from two leading social science publishers. 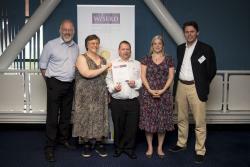 Ceri’s partner organisation is the Wales Council for Voluntary Action (WCVA). Ceri Dalton and Anne Collis both hold a Knowledge Economic Skills Scholarship funded under the European Social Fund (ESF).